Wait, it’s Tuesday already? What happened to Monday? Dang. I was kind of planning to post another Hawaii picture today, but when I started digging around looking for one (shouldn’t be THAT hard, I haven’t even gone through half of them yet, so the number I have available to choose from online is pretty small) I stumbled across this one from Yosemite. So I figured I’d save Hawaii for another day, and here we are. I took this one with my wide-angle lens (Tokina 11-16), and it’s true that super wide-angle lenses cause some crazy distortion around the edges. But yes, that tree really was growing at like a 45 degree angle. I thought I had done a fairly good job at keeping everything as level as it can be, but now that I’m looking at those trees in the distance on the right, I’m thinking that side might be riding a tiny bit too high. Hmm. Oh well. This was taken the first weekend in November last year. I was down in San Francisco for work, so I took a weekend to drive out to Yosemite. That was actually my first time out there, but it was really pretty at that time of year. The weather was of course pretty iffy (we only had a few hours of good weather, right after we got there (that’s when I took this and most of the other pictures that I got while there.) The full day we had planned for Sunday got rained out in a pretty dramatic way. Oh well, that kind of thing happens, especially in the shoulder seasons. Next time, next time. Notes: Canon EOS Rebel T1i, Tokina 11-16mm f/2.8 lens. 1/200s, f/7.1, ISO 400. Focal length: 11mm. 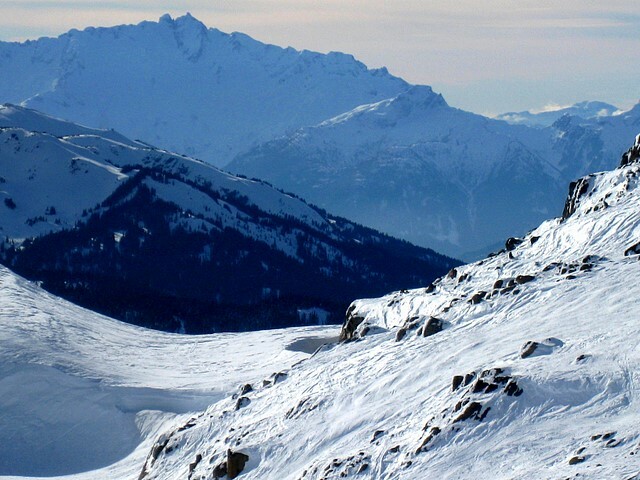 This was taken from the summit of Whistler Mountain, at Whistler-Blackcomb Ski Resort in British Columbia. The normal picture that you’d take from up here would include Black Tusk, but I like this view too. The weather during this particular trip up there was a bit weird though. I took it in January of 2008, but the snow was a lot more like what you’d usually find in April. There was a warm spell that rolled through (that does happen from time to time up here in the PNW), so the snow, while pretty to look at, was kind of grabby and nasty. As in, it wasn’t quite warm enough to be soft and slushy like the *good* stuff you get in the spring (at least, not this high on the mountain, down low it was a lot nicer), but it wasn’t quite cold enough to be fully frozen either. (Yes, I prefer ice and hard-pack to grabby, but both of them are way at the bottom of the list.) Anyway, enough about the skiing. I like the view, and that’s what we’re here for. Notes: Canon PowerShot SD850 IS (Point and shoot). 1/1000s, ISO 80. Hey look. There are some elk up on that hillside. Yawn. Notes: Canon EOS Rebel XT, Tamron 28-300mm VC lens. 1/200s, f/18.0, ISO 200. Focal length: 300mm.